Applications are now open for How to Web Startup Spotlight 2016, deal making program for promising tech startups. For the first time this year, the program welcomes applicants from all around Europe. 50 startups with global potential are expected to join the program and pitch their products on the main stage of How to Web Conference. Besides, they will attend 1 on 1 meetings with potential business partners, gain media exposure, practice their pitch, receive hands-on advice on raising investment, and compete for the cash prizes that will be offered by the main partners of the program. Applications for How to Web Startup Spotlight open on the conference website by September 25th. Organized in partnership with IXIA, Telekom Romania and Bitdefender, How to Web Startup Spotlight reaches its 5th edition, will take place starting October 31st at TechHub Bucharest and will continue on November 1 & 2 during How to Web Conference, at the National Theatre in Bucharest. The program offers emerging seed-stage European startups expert advice and valuable connections with top stakeholders (commercial partners, investors, incubators, accelerators), curated 1 on 1 meetings with potential business partners as well as the opportunity to pitch their product on the main stage of How to Web Conference. 120 startups attended the 4 editions of the program organized so far. In 2015 only, Startup Spotlight brought together 30 startups from 9 countries, representing 14 local startup communities. During their time spent at How to Web Conference, they had attended a total number of 384 curated business meetings with 54 European professionals carefully selected to fit for their development needs. Most of the startups joined How to Web Startup Spotlight in 2015 having at least a working prototype, already close to product / market fit. 27 out of the 30 companies have launched their products or expanded their client base over the previous year. Last year’s winners, Branch Track (the Best Startup), Symme 3D (IXIA Innovation Award), Jaboo (Runner-up), and Safe Drive (Best pitch), have developed companies with outstanding results. “Winning How to Web Startup Spotlight helped us close our seed round”, said Jean Mauris, Co-founder & Head of Product BranchTrack. The primary focus of the companies that have joined the program in 2015 was to expand their network and build their teams. 1 out of 3 Startup Spotlight alumni have grown their teams by 30 to 100% and many of them leveraged their connections with mentors, investors and the other startup founders they’ve met during the program. For in-depth details about the progress made by the Startup Spotlight alumni, check out the progress report available on the conference website. How to Web Startup Spotlight 2016: Bigger, wiser, bolder! 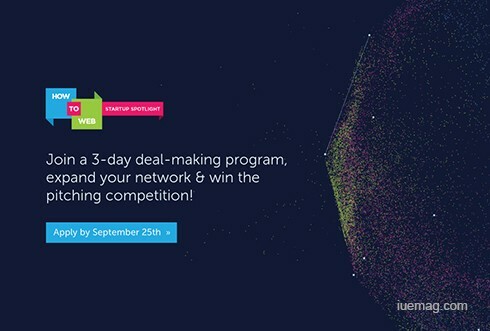 How to Web Startup Spotlight 2016 will be a three-day deal-making program, this time accepting applications from all over Europe. Applications from all startups that are innovating in the eHealth sector, hardware industry, Big Data and Analytics, B2B platforms, Fintech (financial services, payments, insurance, financing, infrastructure, advisory), Cyber Security (application security, enterprise security, defense, disaster recovery), or Gaming & Entertainment (social, games, content discovery, augmented reality, virtual reality), Agrotech, Education and others will be accepted through September 25th. All the companies applying for How to Web Startup Spotlight will get individual support and dedicated meetings with specific mentors and specialists, with a particular focus on Fintech, Cyber Security and Gaming & Entertainment. “By adding a special focus on Fintech, Cyber Security, and Gaming & Entertainment to How to Web Startup Spotlight program and by expanding the selection’s geographical area to the entire Europe we aim to leverage both the regional expertise and the existing market trends. In the Cyber Security field, we have successful active companies as Bitdefender, IXIA, Cyberghost, BullGuard, there are many gaming studios present in the region as EA Games or Ubisoft, and big gaming companies have offices here. Also, new technologies such as AR & VR are being increasingly used by startups to create entertainment products. As for Fintech, we noticed a growing interest in products in this area, as new startups emerge and banks are getting involved in supporting innovation in the field.”, explained Daniel Dragomir, CEO How to Web Conference. How to Web Startup Spotlight is developed in partnership with IXIA Romania, Bitdefender and Telekom Romania and will take place on November 1st & 2nd at the The National Theatre of Bucharest. The most promising tech startups in Europe with less than two years of activity, that have at least a working prototype for their product and have not raised more than 500.000 EUR to date for their current product are invited to apply by September 25th. The application criteria are available online. Attendance to How to Web Startup Spotlight is free of charge and no equity deal is involved for the startups selected to attend the competition. 1000+ tech professionals are expected this year at How to Web Conference 2016, a special edition that celebrates tech startups from all around Europe. Early bird tickets for How to Web 2016 are now available on the conference’s website. How to Web Conference is the most important event on tech innovation and entrepreneurship in South Eastern Europe, organized with the support of IXIA, Telekom Romania, Bitdefender and Hub:raum. The conference brings together startup founders, investors, accelerators, product managers, developers, online marketers & community leaders from all around the CEE. More details about this year’s event and the startup program are available online on the conference website http://howtoweb.co.